A highly trained work force is the foundation to successful Through Hole assembly. We provide our assemblers with the latest training to industry standards assuring you the highest quality. 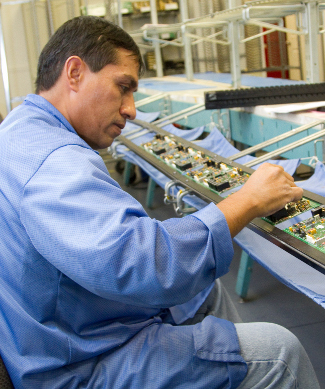 Precision Assembly is ready to handle even your most complex Through Hole assembly challenges. We have expert operators and assemblers that use both manual and semi-automatic placement technology for through hole components. Our two multi-operator manual insertion lines provide maximum flexibility for your dynamic assemblies. Our Through Hole area is designed to meet the demands of the inherent flexibility of Contract Manufacturing. With an average tenure of over 5 years with Precision Assembly, our expert Through Hole Assemblers are loyal, committed, and dedicated to ensuring the highest quality and accuracy of your product.